The Bossier/Webster District Attorney’s Office presented a check earlier this month in the amount of $16,761.24 to the Bossier Sheriff’s Office as part of an asset forfeiture allocation in multiple drug and other investigations. 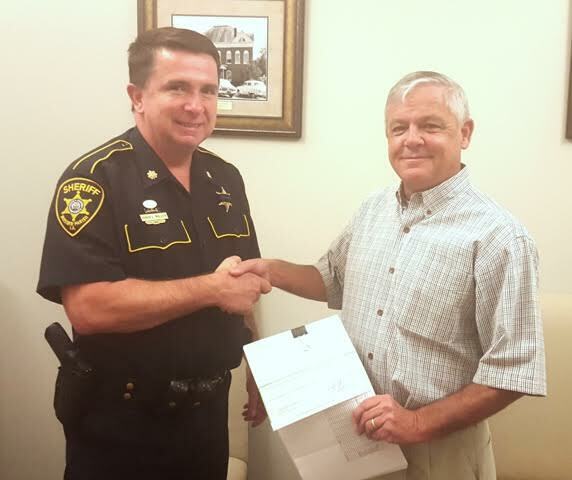 District Attorney Schulyer Marvin presented a check to Maj. David Miller of the Bossier Sheriff’s Office. These funds come from vehicles, other property, monies and bank accounts that were seized in 13 different cases, primarily narcotics over the past eleven months. The total funds are divided among several entities. The Bossier/Webster District Attorney’s Office and the Criminal Court Fund each receive twenty percent. The arresting agency, in this case the Bossier Sheriff’s Office and the Bossier City Police Department receive sixty percent, split between both agencies.